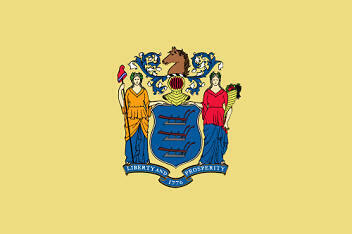 The distinctive buff (light yellow-brown) color of the State Flag of New Jersey depicts the coat of arms on the state seal. 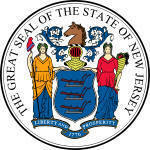 The top image of a horse's head is the New Jersey state animal. The two female figures are Lady Liberty and Ceres, the Roman goddess agriculture. The flag serves as a symbol of honor, heritage and regional pride and is displayed at state buildings. There is a strict Order of Precedence for flags. State Flags are displayed in order as they entered the Union. Car Flags are often displayed to represent of an individual's allegiance to their state. New Jersey State car flags are used by their owners as mobile emblems of their home. Car flags are usually made from strong materials and are attached to a car via a pole and clip window attachment. What is the design of the New Jersey state flag? What does the horse symbolize? What do the images of the female figures symbolize? What does the helmet symbolize? The gold, barred front facing helmet (a symbol of royalty in heraldry) is an emblem of sovereignty for a state that governs itself. What do the three plows on the shield symbolize? Who designed the New Jersey State Flag? What is the history of the New Jersey State Flag? 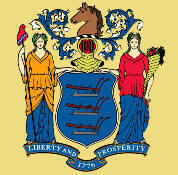 The New Jersey flag is kept and used as required by the code specified in the constitution of the state.